40% stiffer and 88 pounds lighter than the old one, the new Audi S5 Cabriolet is a serious performer in the sporty coupe convertible segment. The 3.0-liter V6 swaps out the old supercharger for a turbocharger, and now generates 354 horsepower and 369 lb-ft of torque. Power gets sent to all wheels via quattro AWD, with only a ZF-based 8-speed automatic available to shift gears. The S Sport Package adds red brake calipers, sport adaptive damping, and a sport rear differential. Available safety equipment includes traffic sign recognition, lane keep assist and adaptive cruise with traffic jam assistant. This is it – the four-ring bearing competitor to rival the Mercedes-AMG C43 Convertible and BMW 440i Convertible. 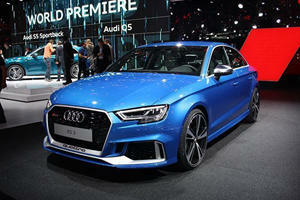 Based on the stylish S5, itself derived from the Audi A/S4, quattro all-wheel drive is a given, as is brutal performance. In this generation, Audi has ditched the supercharged engine of old, with the new unit living up to the V6T badging adorning the fenders. With rivals embracing all-wheel drive readily now, Audi’s claim to the throne of all-wheel drive performance is under threat. 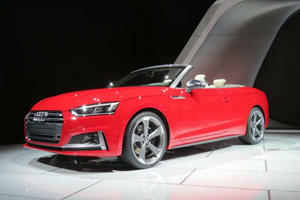 The soft-topped S5 Cabriolet stands to either cement Audi’s place as king of the hill, or highlight its fall from grace. Unlike the BMW 4 Series convertible, Audi chooses once again to equip the S5 Cabriolet with a power retractable soft-top roof. The multi-layer acoustic roof insulates against wind noise when the roof is up, giving almost coupe-like atmosphere with the roof up. With the roof down though, a process that takes 15 seconds (18 seconds to close), there’s noticeable buffeting so it’s best kept for low speed cruises, and without rear occupants. Rear occupants will find the cabin cramped anyway, particularly leg room, though even with the top up, head room is surprisingly capacious. Like the S4, and all new Audi models, the crown jewel of the S5 Cabrio’s cockpit is the virtual cockpit – the 12.3 inch customizable display responsible for drive info, navigation, and infotainment. The S5 also has an available full color heads-up display, placing any and all information required directly in the driver’s control. Compared to the old S5 Cabriolet, Audi claims the new one boasts 40% more structural rigidity. The new Cabrio is also 88 pounds lighter than the old model, despite the extra strength. Less weight and extra body strength minimizes the variance in the drive between the coupe and convertible models, and while the disparity still exists, its less obvious than ever. Reduced body flex makes the S5 Cabrio exciting to drive. Through changes of direction and over varying surfaces, the chassis holds up superbly and maintains solid control with minimal flex. Smooth, direct steering assists the keen feel, and the available torque vectoring rear sport differential helps tighten lines through sharper corners. Audi’s quattro all-wheel drive system ensures the S5 Cabrio stays stuck to the road surface in all conditions – but the new model no longer suffers the infamous ‘Audi understeer’, providing keen dynamics, even if they are a little cold. Audi has developed a reputation over the years for producing compelling V6 motors. The 3.0-liter V6 found under the hood of the S5 Cabriolet features a single twin-scroll turbocharger instead of the previous generation’s supercharger, to help it serve up 354 horsepower and 369 lb-ft of torque on a silver platter. Power reaches the ground through Audi’s famous quattro all-wheel drive, and is routed through a ZF-sourced 8-speed automatic gearbox – the same as used by BMW and Alfa Romeo. The engine, gearbox, and AWD system combine to deliver a 4.8 second 0-60mph time. 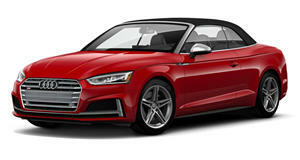 The Audi S5 Cabriolet is available in two trim levels. Premium Plus kicks things off, featuring leather and Alcantara seating, a 7.0-inch central MMI infotainment screen, cruise control, heated seats, and three zone automatic climate control. But it’s the Prestige trim you want – complete with heads-up display and virtual cockpit, as well as a Bang & Olufsen 10-speaker sound system, and surround view parking camera. Safety features include stability and traction control, ABS with EBD, and forward collision warning. Adaptive cruise control is available as part of an assistance package, that also includes traffic sign recognition and active lane keep assist. The Audi S5 Cabriolet is a keener driver’s tool than you’d think – far closer to the coupe than many rival convertibles are to their own coupe counterparts. The S5 Cabriolet Prestige is our pick, for the heads-up display and virtual cockpit first and foremost.